Go Go’ers, it goes without saying that you are voting today. Reward yourself for doing your democratic duty while riding out the results at the following establishments. Patriotic fervor may ensue. Also, patriotic drinks. Seven Grand (515 W 7th St, 2nd Flr, DTLA 90014; 213.614.0737; RSVP here.) Past spots for your “I Voted” sticker have included your shirt, your baseball hat, and — whimsical you — your third eye. This year, Vote for Whisky. All shades of politics represented at Grand Park. 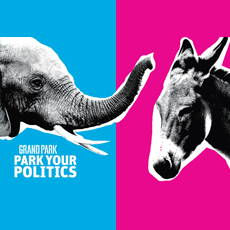 Grand Park (200 N Grand Ave, 90012; 213.972.8080; more info here ) Democracy is for everyone and so is Grand Park, which will be hosting a free, open-to-the-public, 5:00 to 10:00 pm election night event. Results coverage will be projected on a GRAND 30-foot-screen on the performance lawn. You like your CNN talking heads giant-sized. Anthony Valdez of KCRW will be special guest DJ in addition to DJs from dublab. Food trucks will be available to keep you gnawing off a finger with hunger and nerves. Lexington Social House (1718 Vine St, Hollywood, 90028; 323.461.1700) Be a non-partisan partier with the red, white and blue”Flag Flight”. Try saying that ten times fast…. The “Election with Lexington” special is a three cocktail tasting for $18. Starting at 5:30 pm, sample the Red (muddled strawberries and basil leaves, simple syrup, vodka, apricot liquor, lemon juice, tiny dash of peach bitters, and a dash of sprite), the White (tanteo chocolate, coffee liqueur, horchata) and the Blue (lightly muddled serrano chili and sage leaves, Reposado tequila, blue curaçao, fresh lime juice, agave nectar, and fresh pear puree over ice). A couple of those and you’ll be as star-spangled as Old Glory. Rock and Reilly (8911 W Sunset Blvd, WeHo 90069; 310.360.1400) Are you as pugnacious passionate about politics as the Irish? Have you called in sick and committed to an all-day election watch? 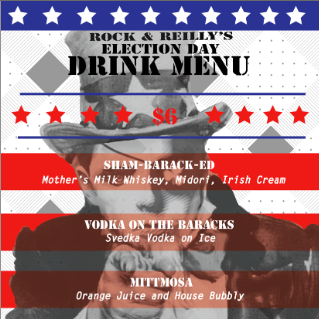 The WeHo ‘hood Irish pub is serving up MittMosas (OJ and champers), Vodka on the Baracks (Svedka Vodka on Ice), and Sham-Barack-ed (Mother’s Milk whisky, Midori, Irish cream) from 8:00 am ’til you collapse. Plus, 17 indoor and outdoor big screens will feature live results coverage at night. Hammer Museum (10899 Wilshire Blvd, Westwood 90042; 310.443.7000) Don’t want to swig Great Lakes Blackout Stout and stare at the T.V. by yourself all night? The Hammer’s FREE election night event offers plenty to keep you busy. Live results coverage will be screened in the Billy Wilder Theater and in the museum’s cafe, Ammo. Check out Jonathan Horowitz’s installation Your Land / My Land: Election ’12, which features monitors on both MSNBC and Fox News. In the courtyard, a cash bar and a highlight reel of TV’s best political parodies will keep you occupied ’til decision time. Think of the latter as weapons of mass distraction. Rush Street (9546 Washington Blvd, Culver City, 90232; 310.837.9546) No matter which party you’re affiliated with, Rush Street has L.A.’s biggest Election Party. Starting at 6:00 pm, 15 wide-screen TV’s on two floors of bars, lounges, and patio decks will feature non-stop election coverage. The whole set-up is perfect for pacing. Calm your nerves with $4 Red/Blue draft beers, $8 Commander-in-Chief cocktails, and an all night, half-price bottled wine menu. Settle your stomach with dinner (5:00 – 10:00 pm) and gourmet pizzas (’til 11 pm). Plus, Rush Street is giving out free Presidential party favors. Fingers crossed for purple stadium horns. Café del Rey (4451 Admiralty Way, Marina del Rey, CA 90292; 310.823.6395) Watch the sun set (finally!) on the 2012 election at Cafe del Rey while sipping $6 election-themed cocktails like the Barockin’ Bayonet (coconut tequila, blue curacao and lime! ), the Not-So Radical Romney (bourbon, cranberry, grenadine), and the 270 (Charbay vodka, blue curacao, grenadine, and Sprite). Design proposition for politicians: make Old Glory red, blue, and purple…. Wear your “I Voted” sticker and get a free cocktail with the purchase of a second. Happy hour pricing and election coverage on flat screen TV’s (starting at 4:00 pm.) are in effect all night long. 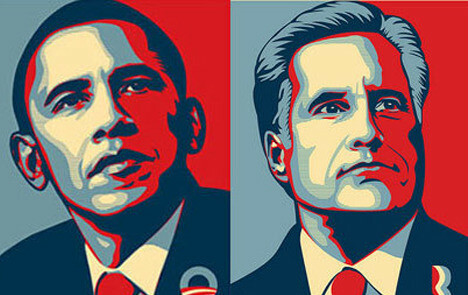 Given the situation in Ohio, you’re counting on both. Ready? U Know U Want 2 Go Go…VOTE!